It's the last week of summer vacation for my kiddos. It has been a great summer, spent many weekends with family and friends, attended weddings, and visited Spain. Now I am looking forward to early mornings, helping my kiddos with elementary homework, attending school activities and some alone time. 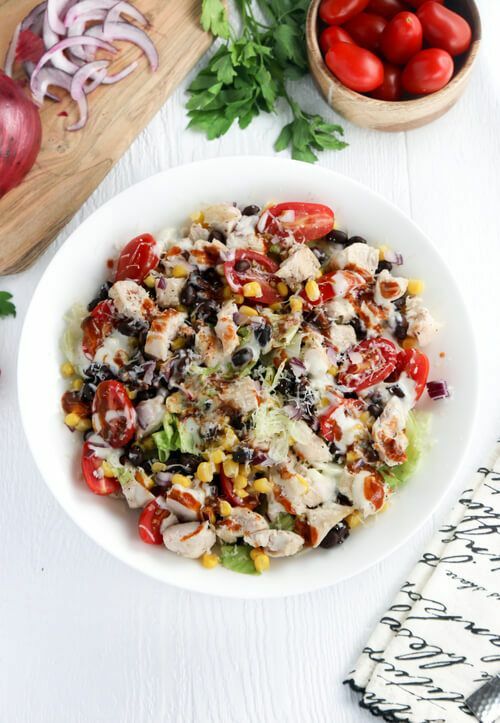 I have been wanting to do this BBQ chicken salad ever since spring. My husband and I visited a lovely family this passed spring, and the host made this salad. At first, I wasn't sure how ranch and BBQ could come together in one bowl, but after I tried it, it was pretty tasty, and I have been wanting to make it ever since. This salad contains a lot of benefits so be ready to dig in! First of all, the first ingredient on this salad is extra-virgin olive oil. Although this recipe calls for only 1/2 a Tablespoon, this healthy ingredient ties to weight-loss and boosts metabolism. And don't underestimate the red onion either. There is only 1/4th of it in this salad but red onion is good for keeping up your immune system. As for one of our main ingredients, chicken, provides an excellent source of protein as well as supports bone health and builds muscle. Enjoy this salad! In a medium skillet over medium-high heat, heat up 1/2 Tablespoon of extra-virgin olive oil. Season 1 chicken breast with a pinch of salt and pepper on each side. Add to skillet and cook through, 4 minutes each side. Set aside to cool. Place chopped romaine lettuce in a bowl, top with sliced cherry tomatoes and diced 1/4 red onion. Drain corn and black beans and add to salad. Dice chicken breast into bite size pieces and also add to salad. Pour 2 Tablespoons ranch and 1 Tablespoon bbq sauce on top of salad and lightly toss to combine everything together. Grate1/4 cup Monterey jack cheese on top of salad.